For many years, the SPI team of professional sand sculptors - the Sons of the Beach Sand Castle Wizards - steadfastly refused to become sand pounders. The hand-stacking method of sand castle building described on this site was developed by Amazin' Walter and it served us well over the better part of two decades, taking us to beaches (and malls and parking lots) as far away as Japan and Europe that we might never have gotten to see otherwise. Some of the big contests even added hand-packed categories; an award that I won the first time it was offered at the World Championship in 1996. While other master sculptors may think the hand-stacking method inferior, we have long been fond of saying that "stacked sand is happy sand." However, one of the main reasons we avoided forming our sand piles was the tremendous amount of hardware required. Years ago, serious sand sculptors relied on massive wooden forms - similar to those used to form concrete - and heavy iron tampers to pound the sand into submission. You could wear yourself out just getting all this stuff to the beach, and the SoBs are somewhat famous for our ability to avoid anything that smells like work. More recently, some bright sculptor figured out that above ground pool siding also worked for forming sand. While still bulky and heavy, these forms could at least be coiled up and moved - even flown - in a trash can. This was still a lot of work, and though we invested in some of the stuff and have used it on occasion, we continue the quest for lightweight but strong flexible form material. 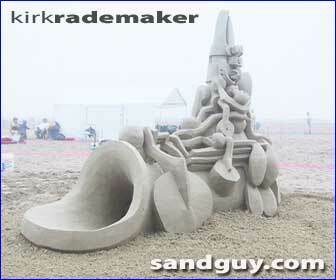 But thanks to the innovative mind of a good friend of ours, sculptor Kirk Rademaker of Santa Cruz, CA, sand sculpture forms have come to the masses. He discovered that 30 weight roofing paper works nearly as well as pool siding - but it is a lot lighter, cheaper, and much easier to find. A 16" roll will fit in a smallish duffle bag and can be easily cut with a utility knife to create any size form you need. Appropriately enough, these forms have become known in the professional sandsculpting world as "Rad Forms."